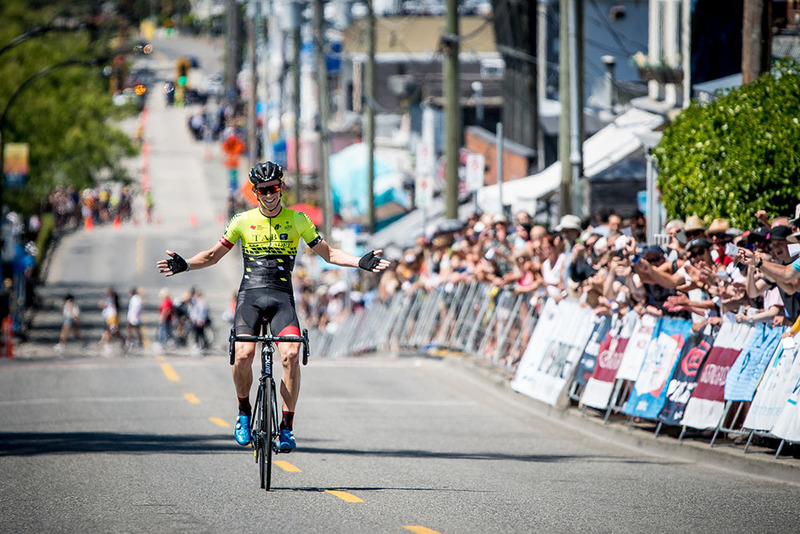 On a scorching hot summer Sunday in White Rock, Brendan Rhim made it look easy in winning the Tour de White Rock presented by Landmark Premiere Properties Westminster Savings Road Race to wrap up the BC Superweek cycling series. Make no mistake, it wasn’t easy, but the 22-year-old broke away with about 50 kilometres remaining in the 130 kilometre race to cross the finish line alone in three hours, 28 minutes and 35 seconds. "This is a pretty hard course, I've never done it before, so I was a little unsure I could stay away. Especially the short laps on the finishing circuit, I knew they were going to be hard with the short little hill. I measured my effort, everybody in the group looked pretty tired when I went up the road, soI was just calculating and it was good," said the Norwich, Vermont native riding for the Holowesko | Citadel Cycling Team. The plan for the day for the Holowesko team was to set up Rhim to go away. "We knew this day would be our best shot at getting a win, so Joe Lewis was in the group, I think we had Morgan Schmitt and some of the other guys making the race hard. Once it was down to about 20 guys, we knew it was just taking down one or two individuals and getting separation." Second place went to German rider Christopher Hatz, who made an impression on the BC Superweek field after breaking away early during Wednesday’s Global Relay Gastown Grand Prix and staying away for a big part of the race. On Sunday, he couldn’t catch Rhim, but put some distance between himself and the chase group. "For the first three or four laps I thought, 'Whoa, this is going to be a hot day today' and I saw my teammate Florenz Knauer was doing quite well so I thought I was going to help him, but my legs kept getting better even though I counted all the laps. It was so hard and the hill on that big lap is so steep, it was a bit too steep for me, but I managed to get to the final six laps and I was dying." Knauer, who’s earned the nickname of “Mr. 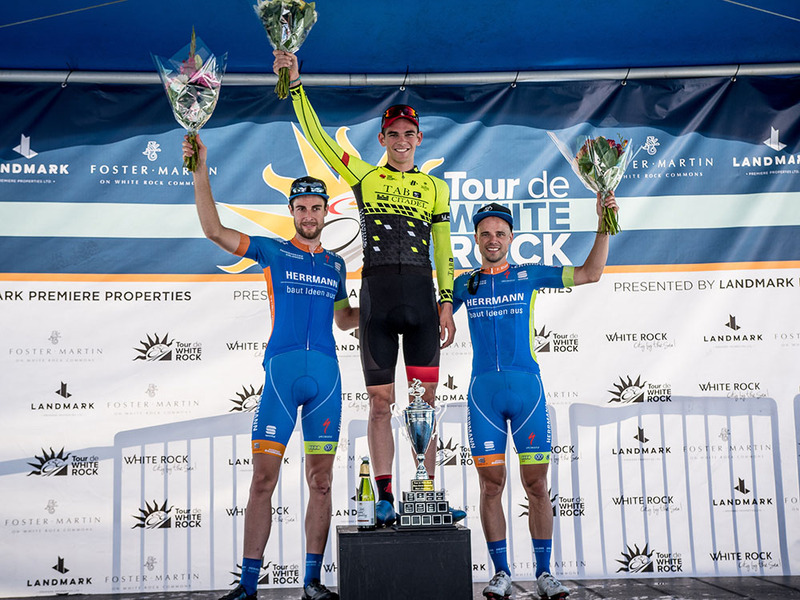 Tour de White Rock” due to his past successes at the event, came third for his seventh podium appearance of BC Superweek this year. The 29-year-old, riding for Hermann Radteam, and Hatz tried to catch Rhim, but the gap was too big to close. "I had an easy time, Chris did all the work up the road, I just had to sit on. All I had to do was make sure no one bridged alone up there and keep the guys under control. If we caught him, I thought I would be fresh enough to still go for the sprint." Knauer won the Tour de White Rock omnium from 2012 to 14 and used his previous race experience in White Rock to gauge whether Rhim would stay on the break or not. "From my experience the last seven times I've done this course, I was pretty sure he could do it. Usually in a group there, it's not always pulling through and some guys are sitting on, making it a bad rhythm - fast, slow - and that gave him an advantage. He was able to just go at a steady pace and keep it going to stay away." 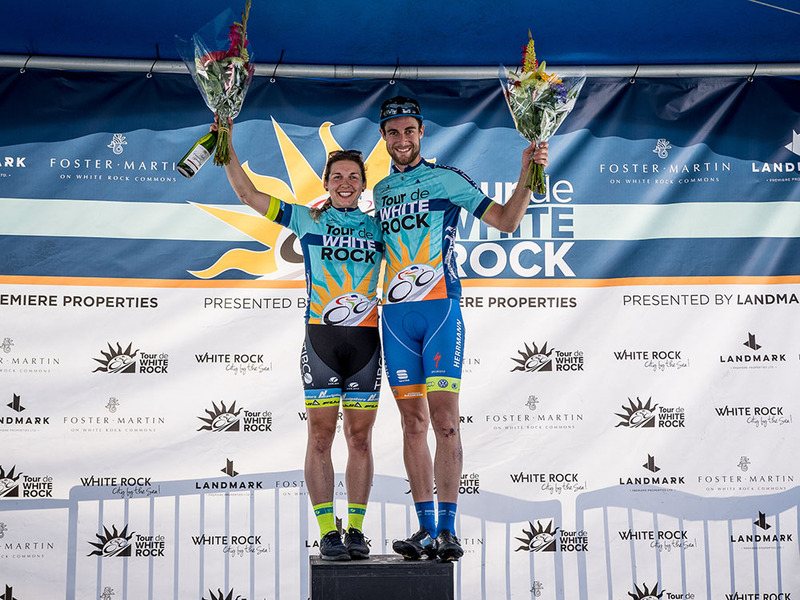 She may be from Vermillion, Alberta, but based on her success over the years, Alison Jackson may as well call the Tour de White Rock presented by Landmark Premiere Properties Westminster Savings Road Race a hometown race. The 29-year-old riding for TIBCO – Silicon Valley Bank attacked with about 400 metres to go in the grueling 80 kilometre circuit and sprinted to take the win. It’s the fourth time in the last five years she’s finished top-5 at the race, but the first time she’s won it. "My fitness is usually really good, and so when we get to the end it's really hard. I'm willing to suffer in the heat and the climbs,” said the 2015 Canadian National Criterium Champion. “A lot of times people think, 'Oh, she's a sprinter and that's about it' but you can't drop me on these climbs. I love a really hard race and White Rock has always been that for me." When Jackson decided to go for the sprint with just under half a kilometre to go, it was according to plan. "I was a little bit further back in the pack than I wanted to be, so coming from about fifth wheel - and the road is pretty narrow at that point - when it opened up I knew I had to go. I would rather take it full from far out than just miss it by going too late." In second was Rally Cycling’s Gillian Ellsay of Courtenay, BC, just ahead of Victoria, BC’s Megan Rathwell riding for the Rise Racing team out of Toronto. Rathwell is a part-time rider who actually won this race back in 2014. "I kind of saw Alison going up the left, it was kind of chaotic, so I just followed her and figured it was a good wheel," laughed Rathwell, who's a full-time civil engineer. "And it worked out!" Jackson’s win caps off a memorable week for her TIBCO – Silicon Valley Bank team, which finished with a rider atop the podium seven times over nine races at BC Superweek. For the Tour de White Rock, it was down to Jackson and Nicolle Bruderer. "We had to play it smart because we only had two people and it's a hard race, lots of climbing and the heat too. Then when you get to the end of BC Superweek, everyone's legs are just that tired so it's tough to know who's going to take it hard in the last race,” she said. “I just really trusted in my legs for making it over the climb and then I knew I'd do well in the sprint, so I was just waiting for that." 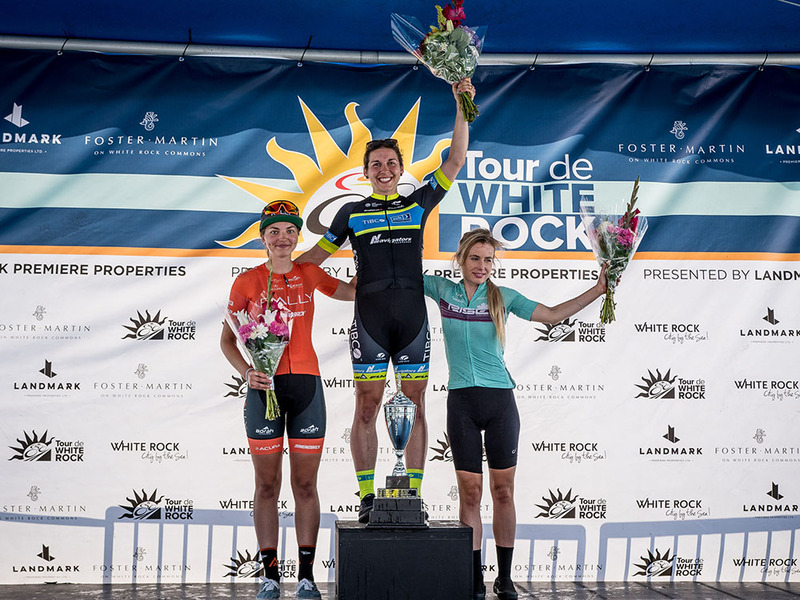 Despite being a former national champion and racing for an American team, Jackson is quick to remember the role that the Tour de White Rock and BC Superweek played in her development and is happy to pay it forward by pushing the young riders in the field. "I think it's such a good series of races for locals to get a chance to race with the pros and I'm particularly really excited about someone like Elizabeth Gin, a junior rider hanging in there and making it today with the second group, that's a great ride for a young girl. You can only have that experience when you have a great race series like this, so I think it's really good for local racing and developing Canadian athletes." BC Superweek is Canada’s biggest professional road cycling series and features more than $140,000 in prize money with nine races over ten days. 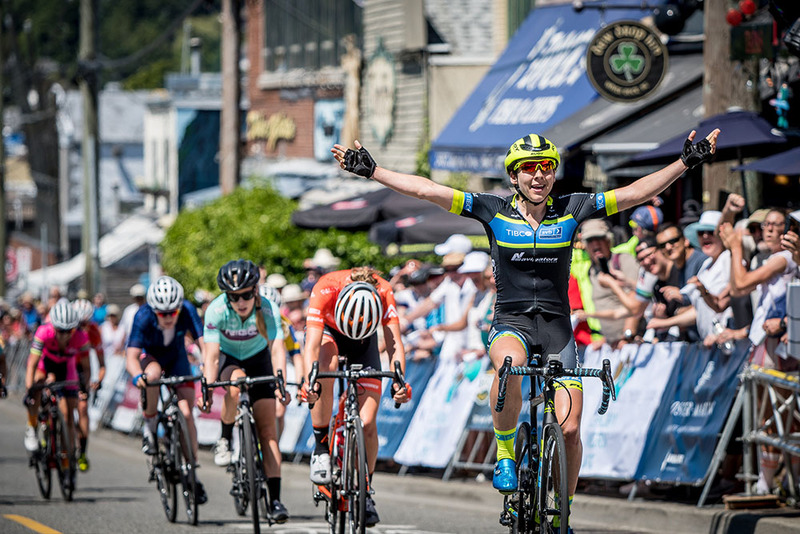 The 2018 BC Superweek ran from July 6 – 15 and was made up of the Tour de Delta presented by Beedie (July 6 – 8), New West Grand Prix (July 10), Global Relay Gastown Grand Prix (July 11), Giro di Burnaby presented by Appia Developments (July 12), PoCo Grand Prix presented by Dominion Lending Centres (July 13), and Tour de White Rock presented by Landmark Premiere Properties (July 14 – 15). 15 Erica Clevenger (USA) Twenty20 Pro Cycling all s.t. 17 Jasmine Soh (WA) V.C. Cascade s.t. 19 Carolyn Russell (Can) Pender Racing p/b Bicicletta s.t. 23 Elizabeth Gin (Can) Cannondale p/b Fortius all s.t. 37 Kate Smith (NZL) Rise Racing all s.t. 5 Edward Walsh (Can) T-Palm PCW s.t. 11 Jure Rupnik (Can) H&R Block Pro Cycling Team all s.t. 13 Ryan Anderson (Can) Rally Cycling s.t.